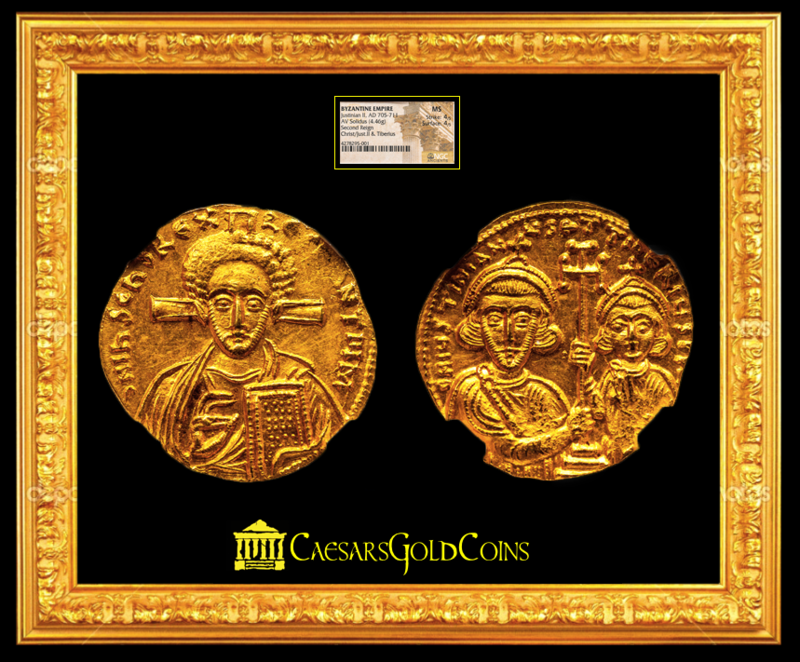 Youthful Christ PortraitByzantine Empire Justinian II, second reign (AD 705-711), with Tiberius. AV solidus NGC 4x4. Incredible deep LUSTER, and extremely well centered both on the Obverse and Reverse. Constantinople, AD 708-711. 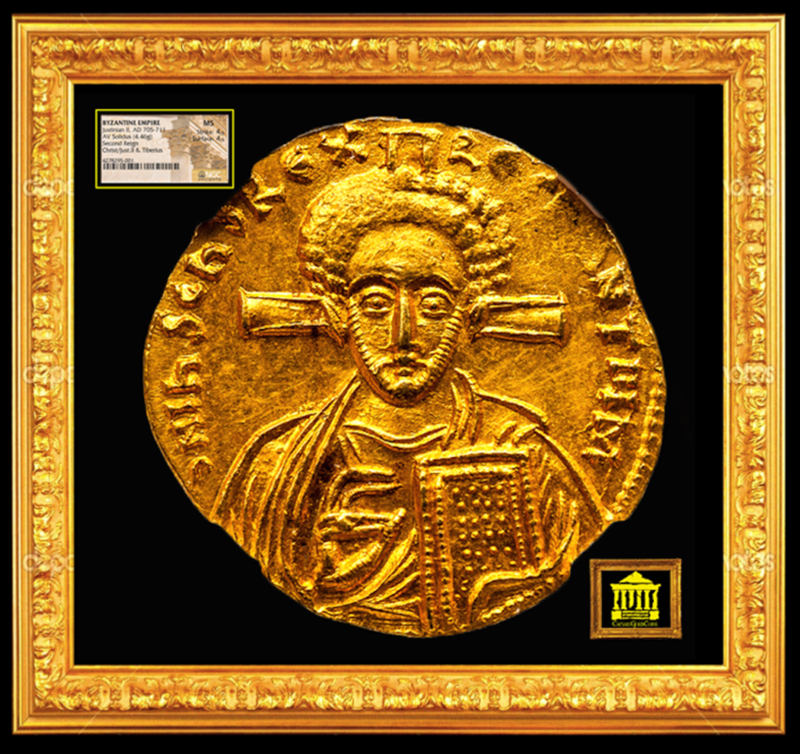 ?N IhS ChS R?X R?GNANTI?M, facing bust of Christ, with short beard and tight, curly hair, wearing pallium and colobium, raising right hand in benediction and holding book of Gospels in left arm, cross behind head / ?N IVSTINIAN ?S ?T TIb?RI?S P P A, crowned and draped facing busts of Justinian II, wearing short beard, and Tiberius, much smaller, each wearing chlamys and holding long cross potent between them. 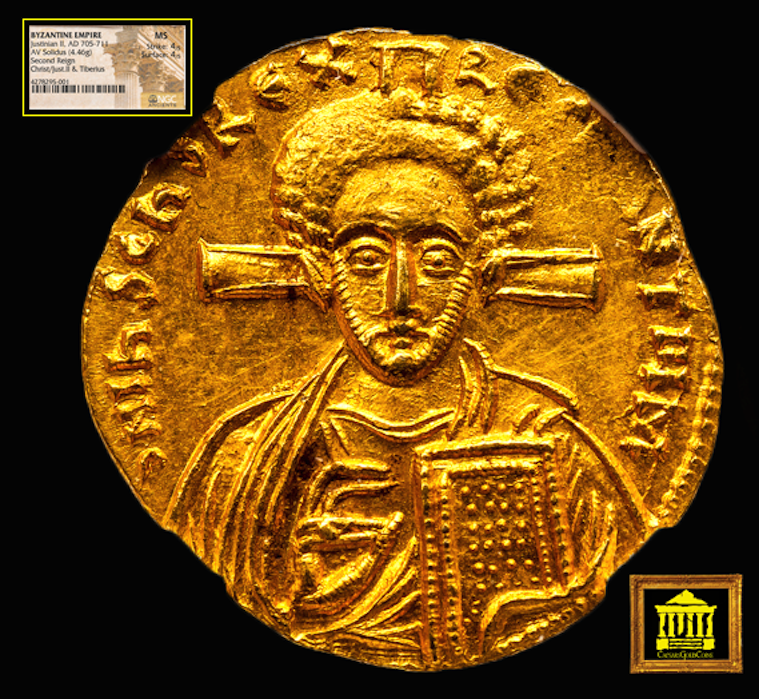 After a decade spent in exile, Justinian II regained the East Roman throne with Bulgarian help in AD 705 and immediately resumed his innovative coinage featuring an obverse portrait of Christ. 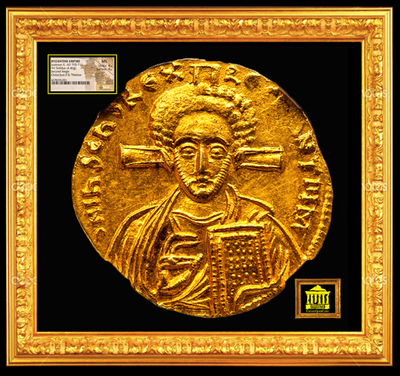 The new sacred image, however, was distinctly different from the "classic" Christ of Justinian's first reign. Jesus is shown in a seemingly more youthful guise, with a head of tight, curly hair and a close-cropped beard, in place of the long tresses and medium-length beard on coins of the first reign. Various theories have been put forth to explain this abrupt change in iconography, but it remains mysterious. At any rate young, curly headed Christ proved a short-lived depiction. It would not be until the end of the iconoclastic era in the late 9th century AD that Christ would again be depicted on Byzantine coins, and the image would revert to the more traditional long-haired visage of Justinian II's first reign.